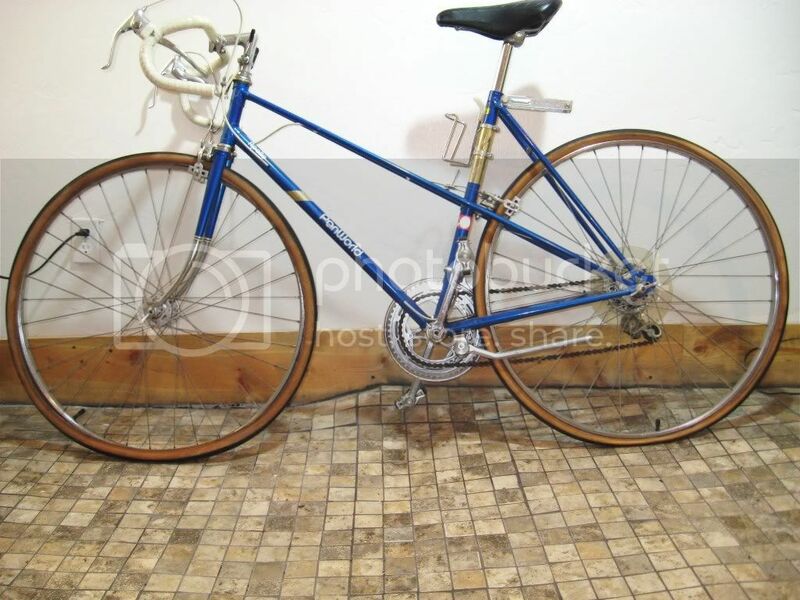 I need a bottom bracket for my early 70's Raleigh frame (wide shell). I have bearings but haven't been able to find the correct cups or spindle to fit. PLEASE email me if you have the correct parts. I have an Apollo, PanWorld bicycle...I was wondering if anyone had any information about it, and how much it might be worth. Why do people always photograph their bikes from the non drive side??? Anyway, the parts that can be seen on this bike indicate that it is a low-end bike boom bike and of little interest to collectors. If it is in good mechanical condition, ride it! I have uncovered a very small peugeot junior bike, appears to be from era 1978-82 based on badge/decals. The bike is all original. Does anyone know about these junior models or how common they were as I cannot find many references except for catalogue pictures. 16 inch frame. Do you mean with 20 inch wheels? Or 24 inch wheels? I have an old Gitane - it looks just like a 10-speed racing bike from the 1970's - except that it is very small and has 20 inch wheels. It has a rear derailler - with a 3-speed cluster. I also have a Lotus model with 24 inch wheels. It is actually a 10-speed.....everything just like an old 10-speed - but with small frame and 24 inch wheels. I think it probably dates back to the early 1980s. These are the only 2 bikes of sort that I have seen in person since I started collecting. I have yet to see another. I did see one on Ebay once, though. They must be pretty rare. I have no clue as to their value. Hi Thanks for the reply. The bike has 20" wheels (500mm)and is fix gear. The bike has lateral handlebars. It definitely has a 16" frame (very small) and appears to be a C42 model made for 6-9 year olds. Some similar models in catalogs have turned down bars are were made as intro bikes for road racing. It looks like a scaled down version of an adults bike rather than a childs bike. Would be hard to ride for a small child I'd imagine due to thin racing rims/tyres. I have yet to see one on Ebay, but will test it out otherwise the bike may end back in the shed for another 20 years. Unable to figure how to attach photo. Weren't some of these baby bikes supposed to have been easily-portable samples for the use of salesmen? I don't know about the samples.....I remember as a child seeing some of these small bikes for sale in catalogs, etc. I'm sure its not a sample bike, more likely manufactured as a childs bike. Has all peugeot serial / model codes and stamps as for full size models. Will continue to search for more information. Thanks for replies and interest. It's a junior racer and they were usually made by the European marques. i was given this old trek road bike. the serial is N5F4A01 with an "s" stamped below it. its in great shape, no rust,and only a few scratches that dont go threw the paint. it has the decal on the seat post with the yellow made in USA stripe. from what i can tell this is one of the 41x or 61x model with the crazy serial number. the hardware matches all of this but like i said according to vintage treks is up in the air as to when it was made. but i dont think the color it is matches the year range, its blue. 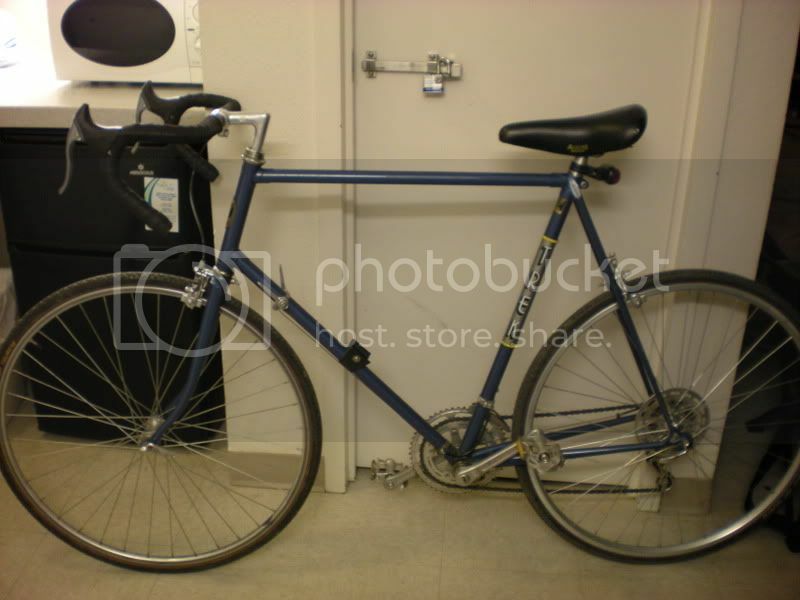 anyways its reynolds 531 it has newer handlebars and shimano 600 brake levers, a newer rear wheel but still have the original slightly tweeked rigidas. anyone have a guess or confirm with mine, that its an 1981 613. and anyone have an idea of what its worth? The color is actually called Gunmetal Blue and you are correct. It would be either a 1981 or 1982 Trek 613. I have a 1982 Trek 614 (triple carnk, outfitted with Suntour Cyclone Mark II derailleurs) that I use as my commuter. Excellent bike I just need something a bit bigger. Nice find. If I were to sell mine, I wouldn't take anything under $200. Vintage steel frames are getting scarce around here, plus, I really like the color. I had what I decided must be an '82 613, although it had the 27" Sunshine/Rigida wheelset that the catalog spec'd for 81. To me its most interesting feature was that it had cable guides stamped Campagnolo brazed on top of the BB shell. The guy at vintagetrek.com basically said this was not possible... so I'm wondering, does yours have campy cable guides? I,m adding this so it may help others with Hyffy information. I was just given the instruction manuals for the three speed Huffy's I found in a yard sale. The issue dates on them is March of 1985. My bikes have the Dayton, Ohio sticker on them which is a little confusing due to Huffy leaving Dayton around 1978. This is something of interest also for on my manuals is an address for Huffy Corp. of P.O. Box 028526, Miami, Fla. 33152-8526. My bikes both have Shimano shifters and wheel hubs. Looks like these bikes may be from the 80's after all.